Just released Mind Mate version 0.5 on Github. This update significantly enhances the image handling capabilities of Mind Mate. Now, you can copy/paste images from the Web Browser, Clipboard or File System directly into Mind Mate. These pasted images are saved inside Mind Mate file, rather than links. 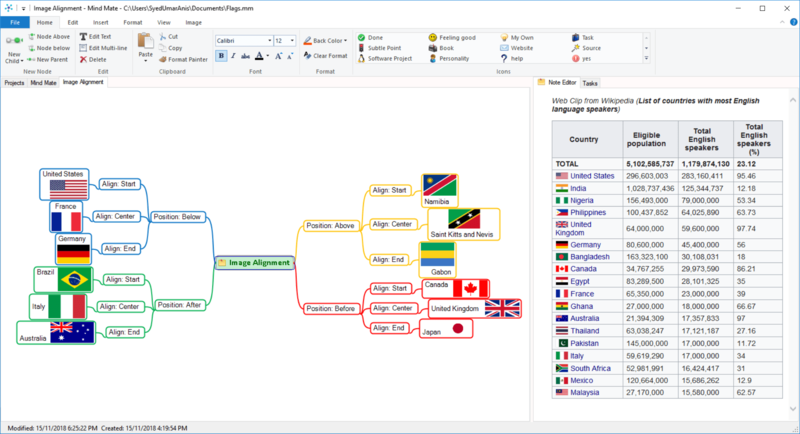 This functionality is supported in both Mind Map and Note Editor windows. Moreover, there is a dedicated ribbon tab for image related operations like resizing, positioning and aligning. Mind Mate’s image and Html capabilities make it an effective tool for capturing and storing part of the web (Web Clips). Primarily being a personal note-taking tool, improvements to web clipping functionality give Mind Mate an edge over similar tools. The file format (.mm) of Mind Mate has changed in this version to support storing images. The current version is backward compatible, but file saved with this version cannot be opened with earlier Mind Mate versions. Following screenshot demonstrates the web clipping and image handling capabilities of Mind Mate.